My Instagram (IG) experience has been enriched with the help of some editing apps that I use to make my photo merit a second look. In my nearly two years of being an Instagram’er, I have tried editing apps—paid and free alike—and experimented on using these apps. Some apps are a bit pricey, but there are so many others that are free. 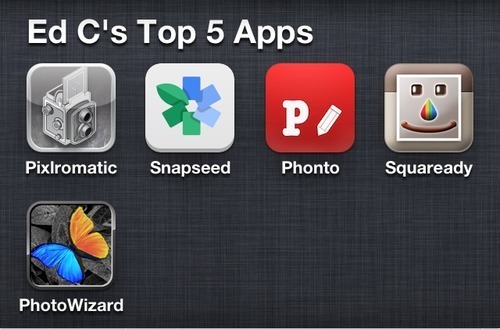 I listed below my 5 most used editing apps for 2012. Pixlromatic. This free app (both at the App Store and Google Play) offers variety of filters, borders and light effects that can enhance your snapshots in so short a time. I usually use this app to create that vintage-feel for my visual stories. Snapseed. I bought this app at $4.99, but it is now free at the App Store and Google Play. With just simple strokes, you can fine tune your snapshots to your desired effect—saturation, brigthness, vignette, tilt-shift can be achieved in just one-two-three steps. Phonto. I am fond of sharing visual stories along with a story written in six words. This free app in App Store and Google Play simply makes putting that #SixWordsStory in the photo hassle-free. Squaready. This free app can only be downloaded from the App Store. Snapshots taken from our smartphones are rectangular in shape, while IG photos are all squares. I use this app to cut these rectangular photos to fit the IG frame. PhotoWizard. This app has a free version but I bought the paid one from the App Store. I mainly use this app for masking and layering—when I wish to put one photo on top of another. I do not use just one app in editing my visual stories. I usually use two or more apps to get the desired effect that I wish to use on my shared visual stories.